2013 was the 100th running of the Tour de France. But did you know that the race has visited Disneyland Paris twice? We delved into the archives to find out all we could about the race’s visits to the resort. The Tour de France is a sort of badge of honour for a French town, if you have not hosted a stage of the Tour de France, you want to, and you are prepared to spend a lot of money in order to get it. It seemed that for our newly launched Disney park in France, that badge of honour was much wanted, or needed, perhaps to prove that Disney wanted to integrate itself into French culture and not be seen as an invading American force. The Tour is screened worldwide, and more importantly, in many European countries such as the UK, France, Belgium, Spain and so on providing a good method of getting cheap advertising. 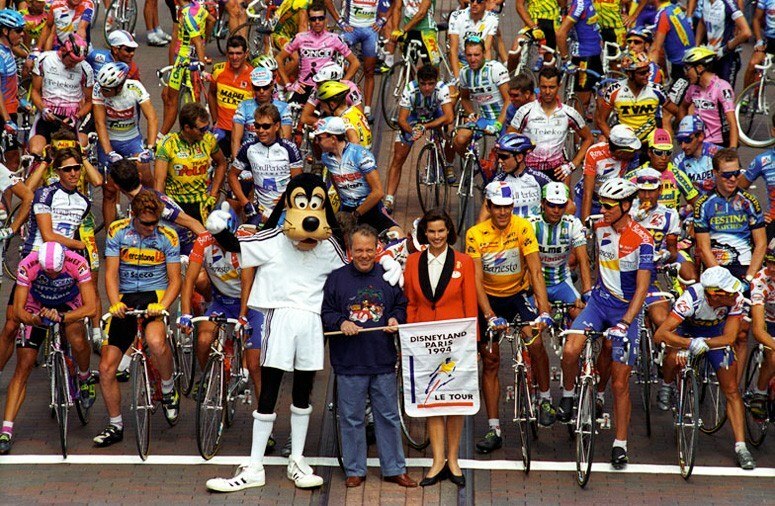 The Tour and Disneyland Paris have a long history, the park has hosted the race in 1994 and 1997. It has appeared in the races publicity caravane twice and even today the race is screened in the sports bar in Disney Village each day in July. So, let’s open that history book and take a look at what we have found. The final day of the Tour de France traditionally starts in a Parisian suburb within easy reach of the capital city of Paris, where the race would end with a few laps of a Champs-Elysées circuit, this stage would mostly be a procession until the riders hit the circuit. In 1994, Disneyland Paris was chosen as the ‘suburb’ to start the final stage. Whilst very little information is available about the start of this stage (as is usually the case, the starts are rarely televised), a few frames did make the highlight reels of the pre-race buildup. The resort would have probably have hoped for a bit more time than 10-15 seconds of footage on the highlight shows, however the Tour is essentially a sporting event. The previous day, Miguel Indurain (one of the 5 time Tour de France winning legends) will have sealed victory. 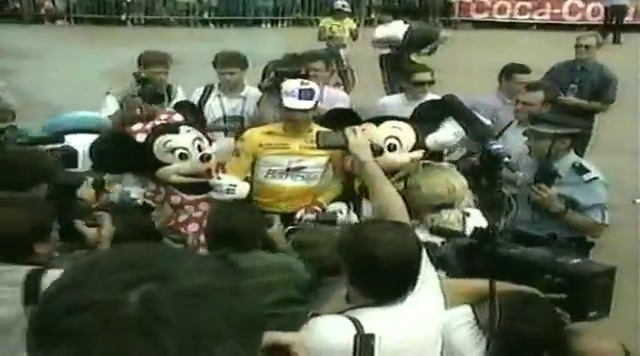 On this July morning, the money shot for the photographers will have been this, the yellow jersey with Mickey and Minnie mouse. Subtle advertising once again for the new resort. The stage start was given outside the Town Square photography store on Main Street USA, and very quickly left the park and headed on its way to Paris. And just like that, the Tour had been and gone. 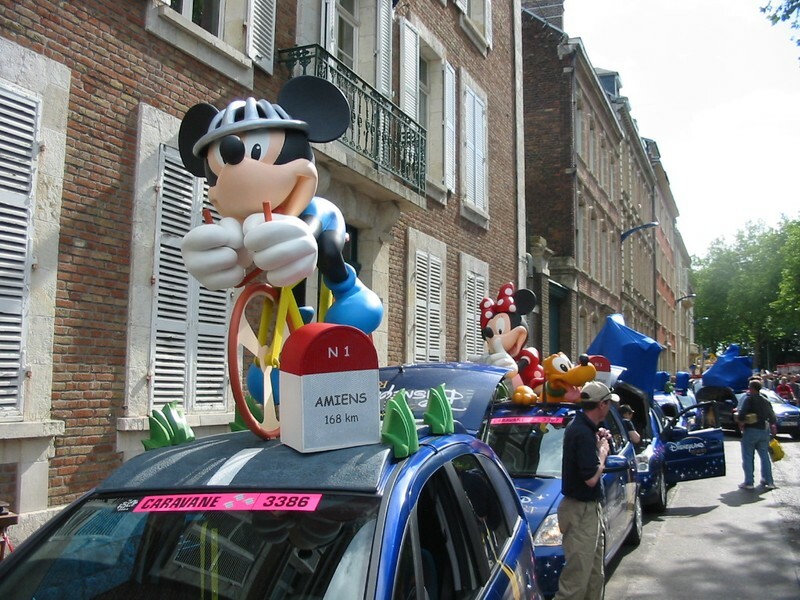 When asked about the decision to bring the race to Disneyland Paris, the race director replied that the race must be modernised, and so a little bit ‘Americanized’, this was probably also to please the new Disney owned broadcaster of the Tour de France in the United States, ESPN. America was an emerging market in the world of professional cycling, the Tour was the first to crack the big money American television market. The worlds biggest cycling race was soon to become much, much bigger. This time the Tour’s visit is much better documented thanks to the effort of French Disneyland Paris fans on YouTube as well as English-speaking Tour de France fans. 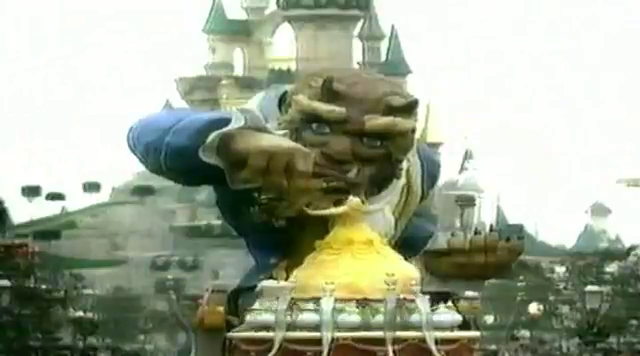 The Australian and British television coverage featured a small feature on the problem of the parks being an American invasion on French culture, but pointing out that essentially the reason for bringing the Tour to Disneyland is to make the race money, much like the original reason for the creation of the race by L’Auto newspaper. This year, two of the twenty-one stages would feature Disneyland Paris. The first of which was Stage 20, an individual time trial from Disneyland Paris to Disneyland Paris. Despite starting and ending in the resort, the stage never actually went into the parks, however it did end on the Avenue Paul Séramy after the main road splits off to become the parking lot. Below is a video from Australian television station SBS which features a full highlight package of the stage, but perhaps only the first 5 minutes is of real interest to Disneyland Paris fans. typically starts with a neutralised section, to allow the riders to find ideal positions in the bunch and to allow riders to warm up a little bit before heading into the race. 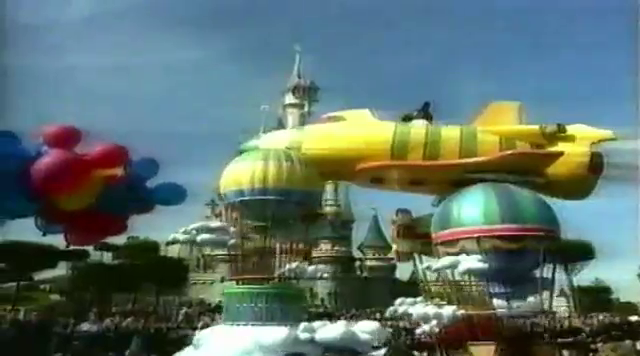 In the case of this stage, the neutralised section took place in the Disneyland Paris backstage area, luckily for us Disneyland Paris fans, footage still exists from this stage on youtube. The race passes through the parade passageways before entering the park itself through the Autopia backstage entrance (we assume, that is not so well captured) before turning onto Main Street USA and parking up for the official start outside the Town Square Photography store, where Mickey was waiting for the bunch in his cycling gear. The footage also features some fantastic aerial views over Disneyland Paris, it also gives us a glimpse of the 5th anniversary decorations for the ‘Carnivale des fous’. Then the race steps out of the park through the backstage entrance next to Discovery Arcade where cast members greet the tour with a cheer, then using the same passageway it used to enter the park, to leave the park, via ‘Parking Nord’ which is reserved for cast members, before exiting backstage at the roundabout near Coupvray. For those who have wanted to see the roads that the parade leaves the park on, this piece of footage really is a gem. A huge thanks to ThunderDCP for finding, or recording these videos and uploading them to YouTube for us to enjoy. If Disney was still an outside force invading French culture, by hosting this race a second time, perhaps Disneyland Paris showcased the best of both French and American cultures. The Tour may not have come to visit the park since 1997, but Disneyland Resort Paris did not let that hold them back. The race is presented with an accompanying ‘Caravane’, essentially this is a rolling advertising cavalcade. Better know by fans as the cars that come along giving free gifts (and a break of watching empty roads) to spectators. 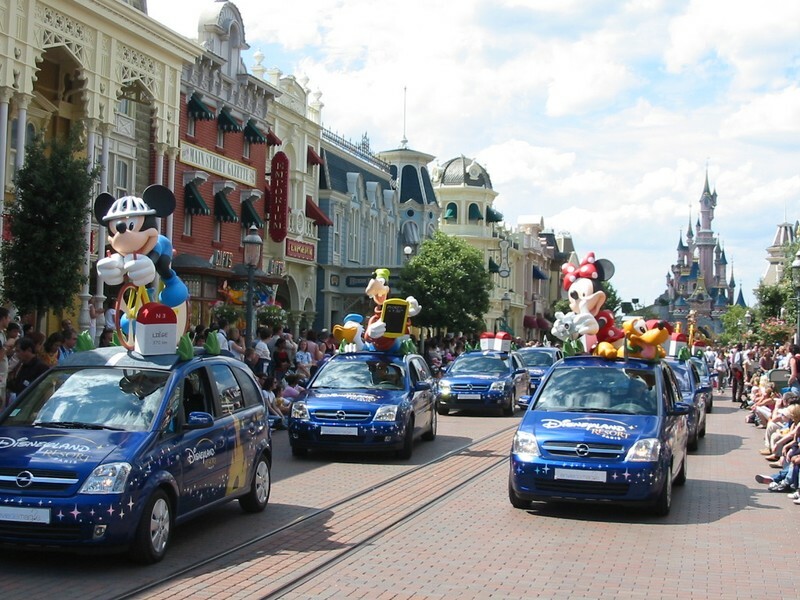 These cars were decorated with Disney characters riding bikes. The message seemed to be that Disneyland Resort Paris is closer than you think with each character being placed next to a distance stone with various French towns listed on them with their distance to the resort. Whilst the partnership between the Tour de France and Disneyland Paris has come to an end (at least for now), Disneyland Paris still is a keen advocate for sporting events, as shown by hosting the LNB Leaders Cup in 2013 (and that will return for 2014) as well as looking into other sporting events. There certainly aren’t any other sporting arenas quite so ‘magical’.